In honour of April Fool’s Day, we at myWholeLife, have decided to expose the top 5 food myths that you may have been fooled into believing. 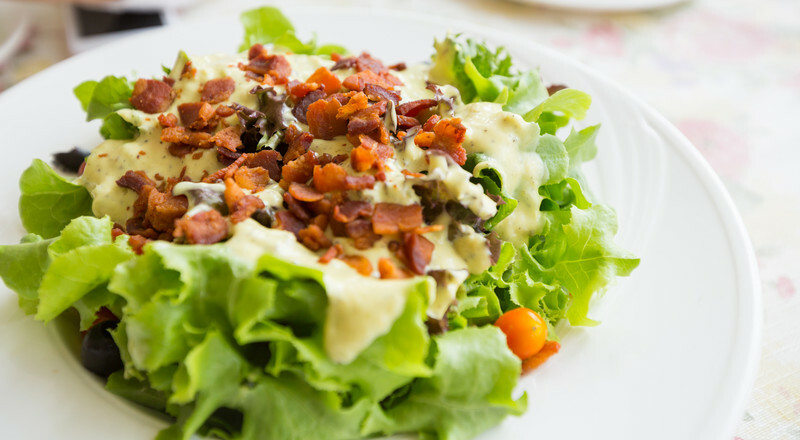 The majority of restaurant, fast food and pre-mixed salads come adorned with highly processed, calorie-dense dressings and toppings. And choosing a mixed green salad with just veggies on it for your entrée is also a bad idea for two reasons. First of all, the lack of fat and protein in plain mixed greens will leave you unsatisfied and drive you straight to the dessert tray, sabotaging any weight management efforts. Second of all, many of the phytonutrients and vitamins in the salad will not be properly absorbed because they need fat for absorption. Sure your bones need calcium, but they also need a variety of other nutrients (vitamins B9, B12, D & K, magnesium and zinc etc.) to stay healthy and calcium on its own is unlikely to promote strong bones or prevent osteoporosis. [i] [ii] [iii] [iv] Also, 65% of the world’s population has trouble digesting the lactose in milk, and drinking it can cause more harm than good for those people. [v] Some healthy bone-building alternatives include leafy greens, broccoli, beans, nuts and seeds. The fat-free craze is simply crazy. Your body needs fat for optimal health and healthy fats not only make you feel satisfied, they also help to slow down digestion so that you feel fuller longer. Also, the fat in food helps to prevent refined carbohydrates and sugars from raising your blood sugar levels. This is beneficial for weight loss because a reduction in blood sugar imbalances means more energy and a reduction in cravings for unhealthy food. Fat-free products are also less healthy then their higher fat alternatives because they tend to be loaded with sugar, artificial sweeteners and sodium to make-up for the lack of flavour. Gluten-free is the newest trend amongst health foodies, but be careful with these products, because many of them are absolute junk. Gluten-free packaged foods tend to be highly processed and loaded with unhealthy ingredients such as sugar, sodium, preservatives and food dyes. Many also contain potato starch, corn starch, tapioca starch and rice starch as a replacement for the wheat. These ingredients can send your blood sugar levels soaring (much more so than whole wheat) which may increase your risk for cataracts, arthritis and heart disease. [x] Consider yourself warned. If these myths are making you rethink you approach to your health, register for our soon-to-be launched FREE Health Assessment which will provide you with a highly personalized assessment based on your main area of concern, food preferences, food allergies/intolerances, plus your age, gender, stress and activity level.